The French for direct is the regular ER verb diriger. To remember this, imagine you direct a DIRIGIBLE! diriger can also mean: to control, to steer, to aim; to be in charge of, to manage, to run, to supervise; to point; to dispatch; to conduct (ie orchestra). - se diriger (vers) (vr) : to head for, to make for. - les dirigeants (nmpl) : leadership; rulers. - dirigeant/e (adj m/f : ruling, leading. About 230 ER verbs end in GER. Before the letter a or o, the g changes to ge so that the g remains soft (like the g in giraffe rather than g in go). Examples of this family of verb conjugations: changer, décourager, diriger, échanger, exiger, ronger, soulager, venger. Direct with learning French, use effective, innovative techniques like Cartoon Memory Triggers. To remember a word, just think of the pic! 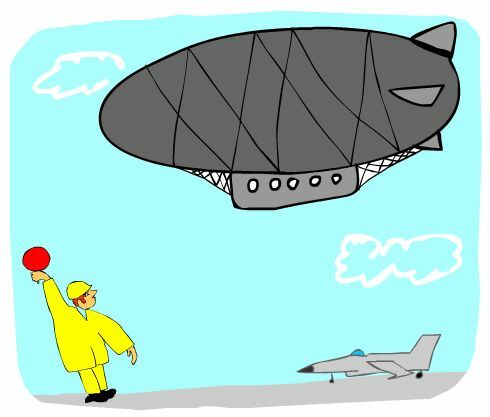 Imagine you direct a DIRIGIBLE. direct! dirige ! dirigeons ! dirigez ! ✔ diriger is a regular ER verb. There are over 5,000 ER verbs these being the most common verbs in French. ✔ Learn diriger and it will reinforce the pattern for ALL those other ER verbs. ✔ You can more easily remember words and verbs like the French verb diriger - French for direct - using the techniques of the world's Memory Masters. 200 Words a Day! Free Daily French Lesson Online - the French verb diriger - French for direct - fully conjugated. French Learning Made Fun and Fast with your free Daily French Verb Lesson - diriger.